Looking to upgrade to an xtra 10? Thread: Looking to upgrade to an xtra 10? If you have an older sled and wish to install an xtra 10 rear suspension you may find this article helpfull. Great sticky, think you can roust up a link for swapping in an Edge in an Wedge? [br]Great sticky, think you can roust up a link for swapping in an Edge in an Wedge? I have measurements for the edge tunnel. I think if you move your stock brackets to these locations it should work?! What suspention do yo have right now? I put the extra10 in my 1994RXL using jbshocks template it worked great.Thank you.The job sounds harder than it is. Awesome! Thanks man! I book marked your site! Good Work! 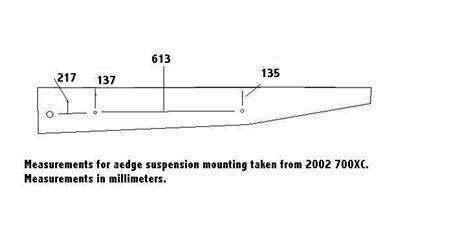 Is that the measurments to put the Edge suspension into the wedge style. If you hit that link there is a link to edge and extra 10 swap. The dimensions work for any of the earlier chassis. I can't find my prox specs yet but if I ever do I will post those as well.